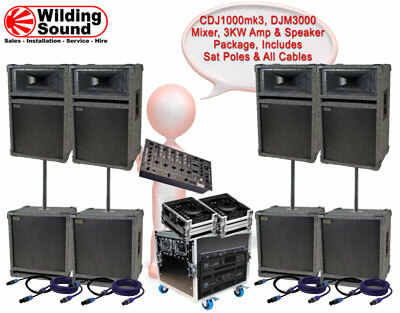 Included with this hire package, is a 1000W stereo power amplifier, 2 Bass bins, and 2 mid tops. 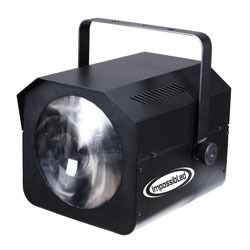 The bass bins, Deltec BX16F, are a compact 1x15" Eminence Kappa driver, rated at 600W RMS. 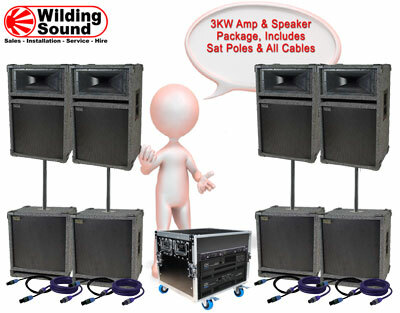 A pole attaches to the bass bin, onto which the mid top cab sits, at perfect ear height. The mid top is a Deltec SX5, featuring a 400W 1x15" Bass-mid driver, a compression driver and a motorola piezo for a little extra sparkle. All leads for full operation are included, as well as the sub/satelite poles, and whatever leads are needed to plug from your mixer. 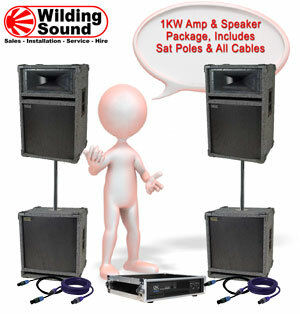 This biamped system, features an active crossover, a QSC RMX2450 (2x650W @ 4 Ohm) doing Mid Tops, and a QSC RMX4050 (2x1300W @ 4 Ohm) doing bass, all housed in a 10U wheeled rack. 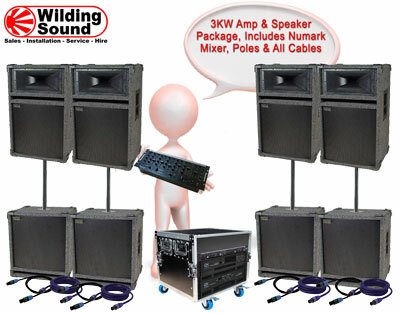 The speakers include 4 Deltec BX16F compact bass bins, rated at 600W RMS each. 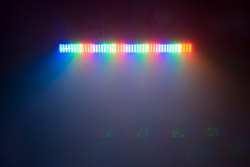 The 4 Mid tops are Deltec SX5, 400W RMS. Even more welly, with a big amp, and seperate bass bins, to augment the mid tops. The system includes a Numark CM200 5 channel DJ mixer, so has plenty of spare inputs for all your DJ sources. 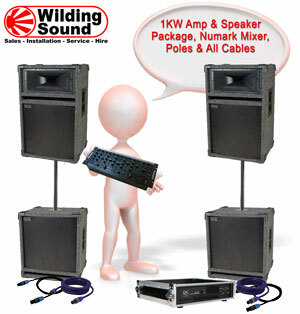 Included with this hire package, is a 1000W stereo power amplifier, 2 Bass bins, and 2 mid tops. All leads for full operation are included, including the iPod headphone out lead and/or our special "anti-noise-from-laptop-power-supplies" audio lead. Standard setup is 2 bass bins and 2 mid tops "either side", but if you want to put a bass bin and mid top in "4 corners", we can extend the leads to suit. 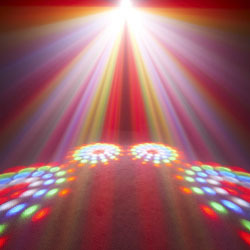 All leads are included for full operation, as well as 4 sub/satelite poles. 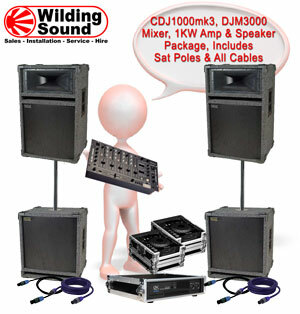 This package includes a pair of Pioneer CDJ1000mk3 CD turntables, along with a Pioneer DJM3000 DJ mixer. All leads for full operation are included, including a iPod headphone out lead and/or our special "anti-noise-from-laptop-power-supplies" audio lead. 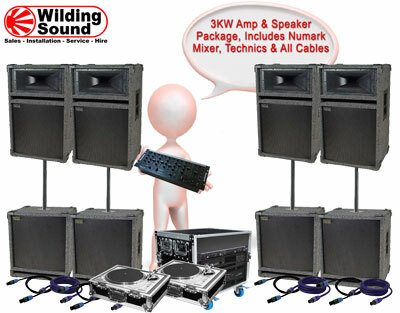 This system includes a pair of SL1210mkii (black) or SL1200mkii (silver) Direct Drive turntables. Stanton Carts and styli, along with a spare stylus to get you out of trouble if the worst happens. The mixer is a Numark CM200, which offers 5 channels, each with 3 band eq, as well as a dedicated mic channel. 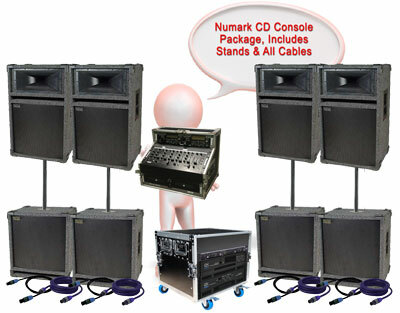 The Numark CD450 Twin CD player, plays normal audio CDs, and will play MP3s burnt to a CD. 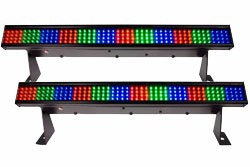 It has variable speed, antishock, seamless looping and scratch facility. 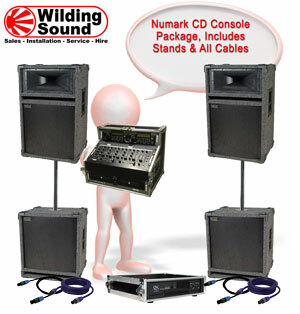 Built into the custom flightcase, is a Numark CM200 5 channel mixer. 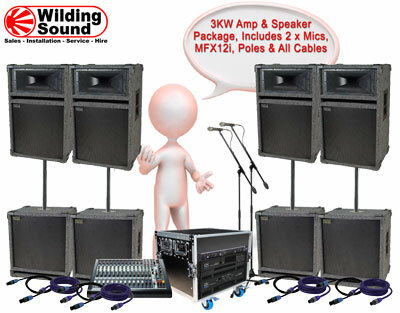 Included with this hire package is a Soundcraft MFX12i mixer, featuring 12 Mic inputs and Digital FX, a 1000W stereo power amplifier, 2 Bass bins, and 2 mid tops. 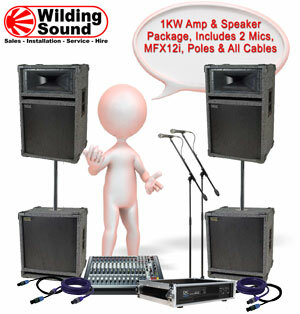 This package includes 2 Shure SM58 microphones, on boomed mic stands each with 10m mic leads and a Numark CM200 mixer.